Sinclair Theatre Reprises BANG, BANG, You're Dead! 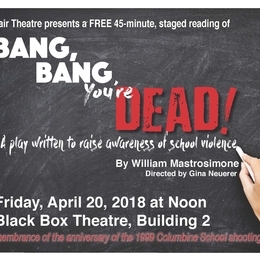 In remembrance of the anniversary of the 1999 Columbine School shooting, Sinclair Theatre will reprise its FREE staged reading of Bang, Bang, You’re Dead! on April 20, at noon in its Black Box Theatre, building 2, on the downtown Dayton campus. The play was written by William Mastrosimone in the wake of three school shootings: Thurston High School (Springfield, Oregon) on May 21, 1998, Heath High School (Paducah, Kentucky) on December 4, 1997, and Westside Middle School (Jonesboro, Arkansas) on March 24, 1998. While written nearly 20 ago, the story eerily mirrors recent events in the United States. Directed by Music, Theatre & Dance department chair, Gina Neuerer, the reading will feature theatre majors: Sydney Baker, Nikki Bentz, Ashton Brunn, Courtney Kakac, Vincent Klosterman, Micah Koverman, Chelsea Overman, Sarah Parrott, Sara Rice, Sarah Skeans, David Thomas, and Jacob Weybright. Student designers include Jessica Hull (costumes), Jacob Rodgers (lighting), Greg Davis (props) as well as production management by Jenna Bousquette (stage manager) and Kimberly Johnson (assistant stage manager). Limited seating is available in the Black Box, located on the fourth floor of building 2 (Room 2411). Take the stairs directly across from the Green Room on the third floor. Doors to the theatre will open at 11:30 a.m. and the performance should last approximately 45 minutes. Please arrive promptly; we will not be able to seat latecomers after the performance begins.